They roll out of bed at 5 a.m. like it ain't no thing, sip green juice like it doesn't taste like grass, and run miles and miles like it's not the most exhausting thing ever. And it's awkward when it comes time to finding the perfect gift for your fit friend because lets face it, you're never going to understand how she willingly gets out of bed at 5 a.m. to go to Pure Barre. This Awkard Gift Guide (the first of 4!) 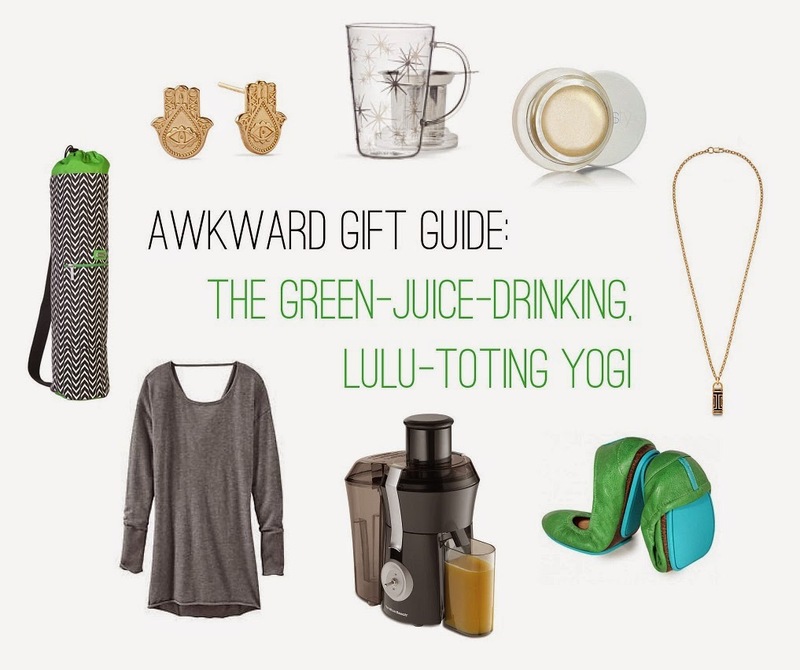 was carefully curated with my top picks for the green-juice-drinking, lulu-toting yogi in your life. Alex & Ani Hand of Fatima Post Earrings ($48): Representative of feminine power these delicate 14K gold dipped studs are believed to channel the forces of good. At the very least, she'll be ultra-chic at the yoga studio. While at the bangle bar pick up a few for your little sister, college bestie, or mom. A stack of Alex & Ani bangles are an all-ages favorite. David's Tea Silver Starburst Perfect Tea Glass Mug ($19.50): A cup of green tea is the perfect way to unwind after a particularly invigorating yoga class or to re-energize during a busy day. Gift your health guru this gorgeous glass mug and a sampling of David Tea's delicious green teas instead of the usual Starbucks gift card. David's Tea has a great selection of samplers for the tea-lovers in your life as well as inexpensive stocking stuffers for hosts and unexpected guests. RMS Beauty Illuminator ($38): This all natural illuminator brightens the face with just a few taps across the cheeks and forehead. Completely chemical free, this oil and beezwax based product is a must have for any beauty junkie. Tory Burch FitBit Pendant ($175): For the stylish gal on-the-go who is never without her FitBit, the Tory Burch FitBit Pendant is ideal for tracking the less sweaty, more glamorous activities of the day. Slip the tracker (sold separately) into the metal locket and go, go, go! FitBit's are a great gift for anyone experimenting with living a more active lifestyle. Tieks Foldable Leather Flats ($175): Spoil her with Tieks foldable flats, flats that go from the yoga studio, to the grocery store and through the commute home in style. Available in a multitude of colors and patterns it's simple to match her new flats to her gym tote or favorite floral leggings. Tieks make the perfect luxe stocking stuffer for any city-dweller or collegiate. Hamilton Beach Big Mouth Juicer ($50): They'll be thankful to save the time and money at the local juicery but next time you come over be prepared to sample a questionable carrot-lime-beet-concoction. Cashmere Drishti Sweater ($198): This cashmere sweater is extra long, oh-so-soft, and ultra wearable in neutral heather grey. Whether she's running errands post barre or lounging with a magazine on a Sunday afternoon she'll be cozy and stylish in this luxurious knit. Ame & Lulu Yoga Bag ($76): With a zip front pocket to hold your phone, card, and keys, this yoga bag is all she'll need for her next trip to the studio. A new mat tucked inside is a thoughtful gift for a new yogi! Check out last year's Awkward Gift Guide for Your Overachieving Sibling for more great gift ideas!